After his first public appearance in 1980, Ignasi Terraza (born in 1962) has played an important role in the Barcelona Jazz scene. His personal, swinging style has placed him amongst the most in demand accompanists in the City, allowing him to back up many of the American musicians visiting Spain, like Frank Wess, Jesse Davis, Gene “Mighty Flea” Conners, Teddy Edwards, Ralph Lalama, Lou Donaldson, Brad Leali or Donald Harrison as well as singers like Charmin Michelle, Randy Greer, Michelle McCain, Lavelle, Dee Daniels, Ann Hampton Callaway or Stacey Kent. Terraza has also been, since its inception, one of the key members of the Barcelona Jazz Orchestra. But Terraza’s favorite setting is, indeed, his trio: regular partners include the likes of bassists Pierre Boussaguet, Darryl Hall or Horacio Fumero, and drummers Gregory Hutchinson, Bobby Durham, Jeff Hamilton, Alvin Queen, Jorge Rossy, Leon Parker or Jean-Pierre Derouard. Influenced by Oscar Peterson, Wynton Kelly and Ahmad Jamal, and rooted in the classic jazz tradition, Terraza is featured in more than 15 CDs, four of them in a Trio format: Let me tell you something (1999), Jazz in the darkness (1999), It’s coming (2004), and In a sentimental Groove (2005) (which won the best jazz record of 2006 award given by the Spanish magazine Jaç). During the last ten years Terraza has kept busy playing around Spain, as well as in Festivals and club dates in Switzerland, Portugal and France. Highlights include the Jazz Aux Remparts Festival in Bayonne, the Jazz in Marciac Festival, the Montreux Jazz Festival, Jazz a Ramatuelle, etc. In 2006 The Ignasi Terraza Trio toured Asia for the first time, playing in China and The Philippines. On May 21st, 2009, Ignasi Terraza became the winner of the 25th edition of The Great American Jazz Piano Competition, an extremely prestigious event held in Jacksonville, Florida, since 1983. This special award was won on previous editions by pianists like Marcus Roberts, Lynne Arriale or Kenny Drew Jr. 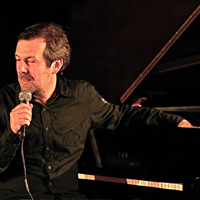 The jury (Marcus Roberts, “Doctor John” and Na’im Talib Rashid) chose Ignasi amongst 46 other pianists because of “his personal musical view” and “his ability to transmit it”. Ignasi performed, in a trio format and to an audience of 650 people, two of his original compositions, Give Me Another and An Emotional Dance, as well as a very personal solo piano version of John Lewis’ classic Django.